Summary: During 2009, with previous support from the Sea Turtle Grants Program, the Tour de Turtles generated considerable public interest in sea turtles and inspired nearly 30,000 unique visitors to log onto the Tour de Turtles website during just a three month period. In addition to reaching the general public and media, the program provides classroom-ready educational resources to teachers in the Florida school system. Over 16,000 educators nationwide have registered to utilize CCC’s online satellite-tracking resources. Registered teachers are provided a free copy of CCC’s Sea Turtle Educators Guide, which provides background information about sea turtles, as well as Sunshine State Standard lesson plans designed to integrate sea turtle biology and the concept of a sea turtle marathon into the classroom. 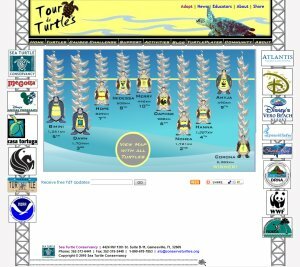 The thousands of people who follow the Tour de Turtles online are provided a free, multimedia website that uses interactive maps, games and activities based on sea turtle migration, biology and conservation issues. The program utilizes satellite telemetry data collected as part of CCC’s ongoing turtle migration studies in Florida and the Caribbean. During 2010, Tour de Turtles will be expanded and broadly promoted to previously-registered educators, schools, educational associations and the general public. Through a growing partnership with Disney’s Animal Kingdom, we anticipate greatly expanding the reach of the program. Results: New animated interviews and announcements were created for the 2010 Tour de Turtles. Latitude/longitude information sheets for each turtle were made available on TdT website. Educators were targeted with a direct-mail postcard featuring new hands-on activities, including a sea turtle quilt project. Species trading cards were created and distributed to Florida educators by mail and at events. STC attended two Florida-based educational conferences and hosted workshops with hands on activities promoting sea turtle education and conservation, and participated in two informational events and distributed trading cards and free educator guides. Tour de Turtles was promoted via the STC website, Twitter, Facebook and other social media websites. Videos and photos related to the live releases were posted in the Community Section of the Tour de Turtles website and on YouTube. Visitation between July 26 to November 30, 2010, for tourdeturtles.org included 32,101 total visitors representing 114 countries, 48,004 visitors from the United States, and 10,584 visitors from Florida. The website received 418,872 page views, with visitors staying an average of 5 minutes 38 sec. on the website. The live releases were equally popular with a combined attendance of nearly 2,000 people for two releases. STC used the activities created for educator’s conferences at the Tour de Turtles live releases at a Kid’s Station, where kids created their own turtle shells and a turtle shell quilt focusing on threats. The Kid’s Station also featured a Turtle Excluder Device and offered kids the option to crawl through for an interactive experience. The Kid’s Station was extremely popular with children and parents. Tour de Turtles received prominent media coverage in Florida, the Caribbean and notably in Scholastic News, a publication for children and educators.